SEATTLE--(BUSINESS WIRE)--Amazon (NASDAQ: AMZN) today announced Amazon Home Services (www.amazon.com/services) has expanded the number of providers and the services they offer in 15 metropolitan areas, including Atlanta, Boston, Chicago, Dallas-Fort Worth, Houston, Miami, Philadelphia, Phoenix, San Diego, San Jose and Washington D.C., adding to existing availability in New York City, Los Angeles, San Francisco and Seattle. 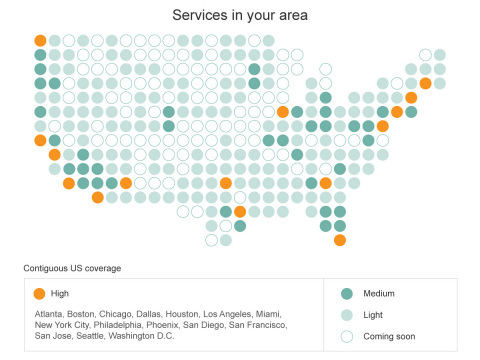 Amazon Home Services now includes over 15 million unique services across more than 900 professional services. Amazon Home Services now offers two ways for customers to shop: custom and pre-packaged services. With custom services, customers can create free requests by simply describing what needs to be done using text and photos and submitting a request to get estimates from local pros. Custom projects can include anything from painting a room to home entertainment setup to central air installation. Customers can also select from hundreds of popular pre-packaged services, such as TV Wall Mounting, Basketball Hoop Assembly or Faucet Replacement. Both custom and pre-packaged services are backed by Amazon’s Happiness Guarantee, award-winning customer service and free verified purchase reviews, so customers can rest easy knowing the job will get done right. To get started with your next home project or to sign-up as a service provider, visit www.amazon.com/services.